This is without a doubt one of the greatest inventions to come along in a long, long, time. I simply love them. I use at home and bought xtra for the Day Care Centers I patronize as they are required to cut their clients nails when needed. They are also awed by these clippers, particularly the scissor-like grips. The grips make it much easier for the elderly who may be suffering from arthritis, or another difficulty when cutting their own nails. A genenious must have thought of this. I use mine for myself and the extra for clipping the cat's claws. Trying to hold the cat and clippers is not easy. This makes it easier. This is the way clippers SHOULD be! This design is the way clippers should have been in the first place. So easy to use and handle. Much easier to grip than conventional clippers! I'm getting more to leave some at work and at home! LOVE THESE! Product makes it easier to trim toenails. I always have trouble holding onto regular nail clippers. They keep slipping out of my grasp. These, however, do not slip, I can use them with great ease. I love them! This does not slip off my hand like the ones you buy in the store. I am so happy with them. Finally there is an effective tool for arthritic hands to do a proper Mani-Pedi. If there was a design for an easy to grasp emery board that would be great. My hands are getting a little less able and these clippers are easier to control. Took it out of the wrapping to use upon using it it broke in half. I also purchased one for my sister she was not happy either. I thought that this would make it easier for my wife to cut her toenails. I have tried many styles of nail clippers as I have problems applying pressure with my thumbs. This design is the only configuration I seem to be consistently successful with as I can apply much better leverage with my thumb all the way through the looped handle without it slipping off. I lose my grip on my regular clippers. I chose thiese clippers because I hope the ez grip will make it easier to hold clippers. Looks like a helpful product. Chosen for ease of use by seniors. The regular clippers are difficult for my arthritic fingers to pinch hard enough to cut my toenails. I am hoping these will give my hands more support. A useful tool for me to use. Hoping they are easier to cut with. 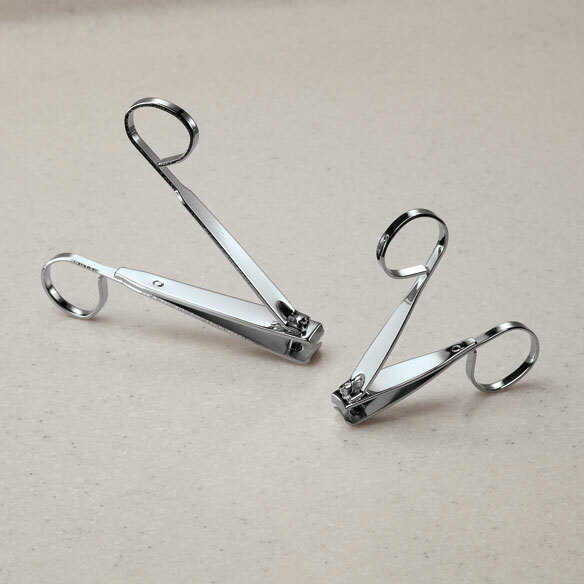 they are easy to use and don't slip out of your hands when you try to clip the nail. Necessery and looking for that too. They look very convenient and since my husband is a diabetic his toe nails are an important part of his health. Since I have to trim them they look easier to use than the traditional clippers. I have peripheral neuropathy in my hands and it is difficult to squeeze clippers. Thought I would like to try them! I can't get a good grip on my old clippers and these look like they would work well. My husband has trouble clipping his nails. These might help. Disabled from stroke difficult to hold clippers. My husband has trouble holding onto he smooth handles of other clippers. It looks like it will help me get a better grip on the clipper. Don't have as much strength in my hands as I used to. Help with keeping toenails cut. To make it easier to trim my nails and my mother's nails. It seems like it could be an easier option than the usual clippers. cutting nails was a big problem for me...others too short. What is the drop down menu? BEST ANSWER: Thank you for your question. The drop down menu is right underneath the item picture and allows you to choose what size you need. We hope this information will be of help to you. finger nails- SM or LG ? BEST ANSWER: Thank you for your question. You would use small for fingernails. We hope this information will be of help to you. how do i enter both 212 and 214 into cart? BEST ANSWER: Thank you for your question. If you select the size you would like from the drop down menu you will be able to add the item to your cart. We hope this information will be of help to you.